Welcome to Art Evolution! This is a place to post our really old artwork, look back on it, and see how we've improved. PM me if you want to be a guest poster. 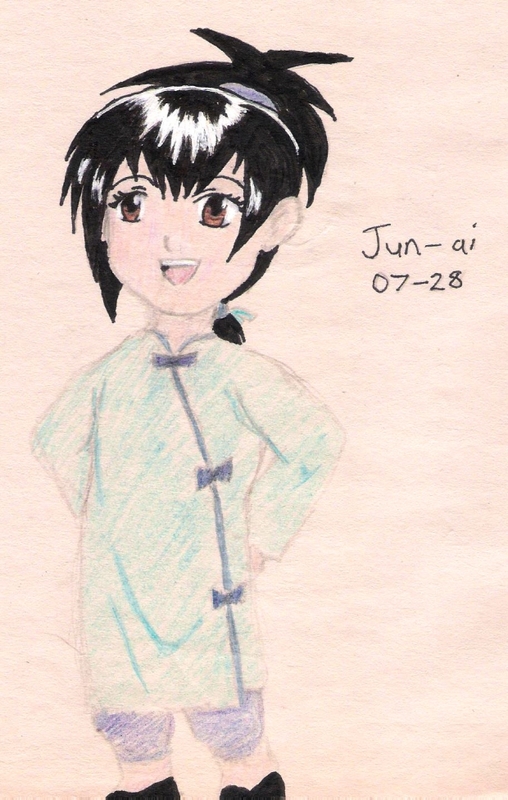 Flipping back through an old notebook, I found some pics of my original character concept for Jun-ai Shen. I first created her as a child character and adapted her to her angsty, barbed-tongued teen version for Eternal Rain. I'm going to guess that this was drawn in late middle-school to early high school... so maybe around 2005? 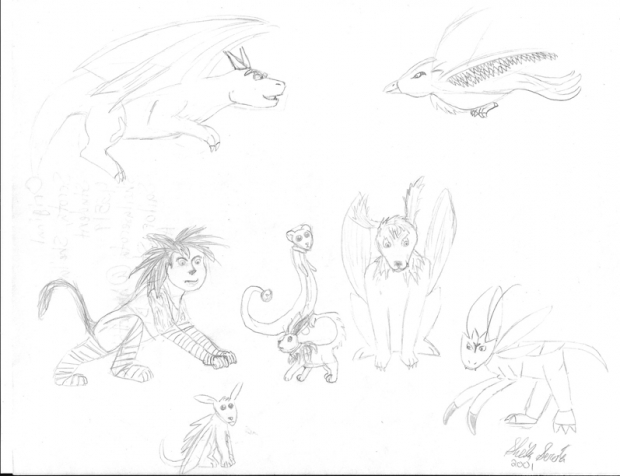 These are the initial designs of the eight trainees in The Rebels of Planet Aadau. 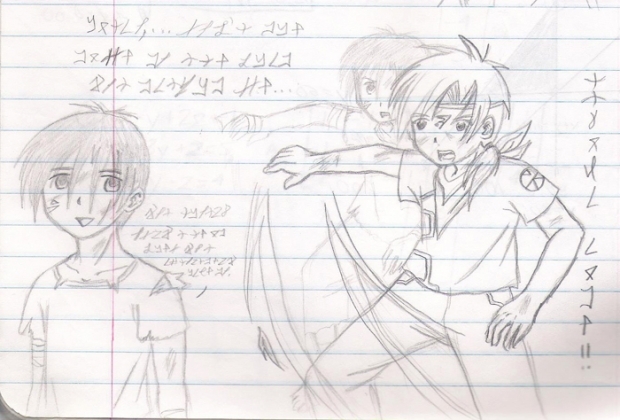 I drew this in 2001 and entered it (and many other drawings) into my high school's anime club contest. Didn't win anything, though. In hindsight, I have a lot of problems with this drawing. Meh-Eh-Vah looks like a mutant Scyther clone. And why is Meh-Eh-Eh standing on her hind legs? (If you read the first chapter of "Rebels" you'll know what I'm talking about.) And Meh-Eh-Tiu just looks... weird. I shouldn't be so hard on my past self. After all, it was like the fourth time I ever attempted anything anime-related. Just so you have a frame of reference, this is what they look like now. And by "now" I mean quite a few years ago. One of the first bits of advice I received about drawing circles is to draw a square and use it as the guidelines for a circle. I used that technique for years-- maybe even a decade-- until I felt comfortable drawing circles on my own. 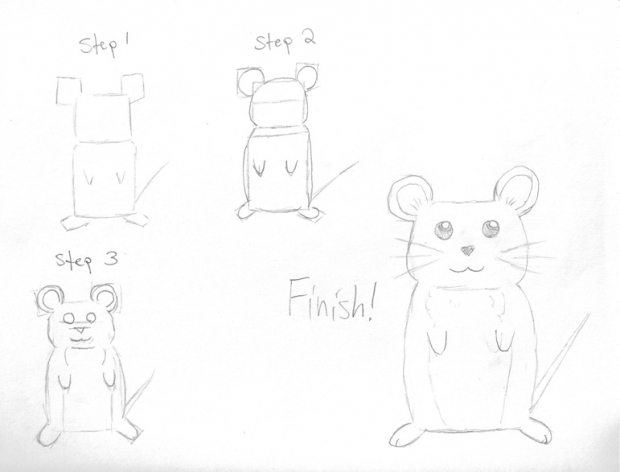 My reason for choosing a mouse was probably because I used to draw Pikachu a lot in those days. Had I actually drawn Pikachu, I would be ridiculed even more than I already was. Back in those days, teenagers and Pokemon did not mix. My, how times have changed. I keep forgetting to post in this World, which is a shame because I have a large backlog of old drawings that I want to share. This is my first-ever destination drawing. I drew it all the way back in 2003. I remember starting the picture just before my senior year of high school. I don't remember when I finished it, but the date displayed on the drawing was when I did. 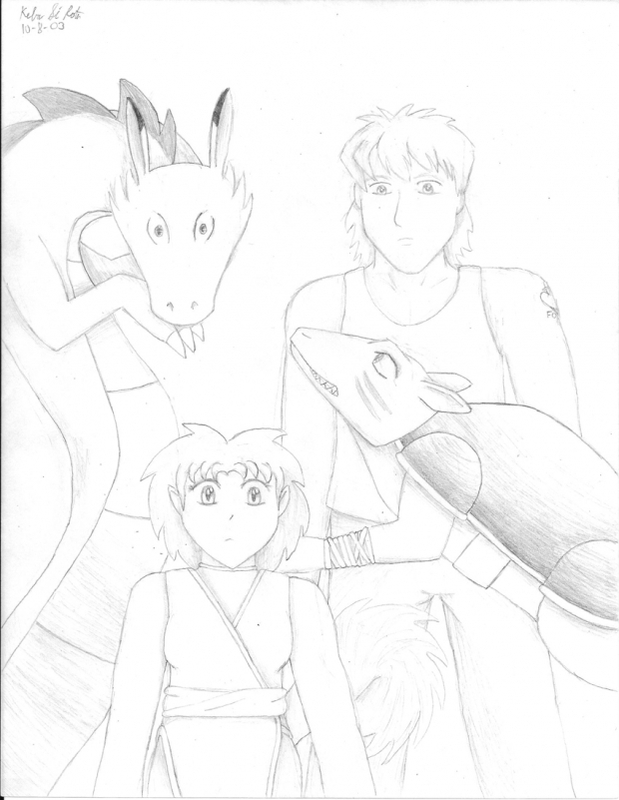 The drawing features Keba, Jon, Rakusa, and an unnamed character. I don't think any of them are the correct size in relation to each other. I;'m pretty sure I haven't drawn the unnamed character since. His role in the story has remained the same, but his appearance has changed a lot in my mind. I won't reveal his role because I don't want you associating the image with him. Now that I think about it, I haven't been able to settle on a hairstyle for my character, Keba. I think I might go back to something like the one here. Again, this was drawn in the empty spaces of my math notebook, around the same general time as Toki's expression memo (2007). In this drawing, Reka still has that headpiece from his original design that I later discarded.